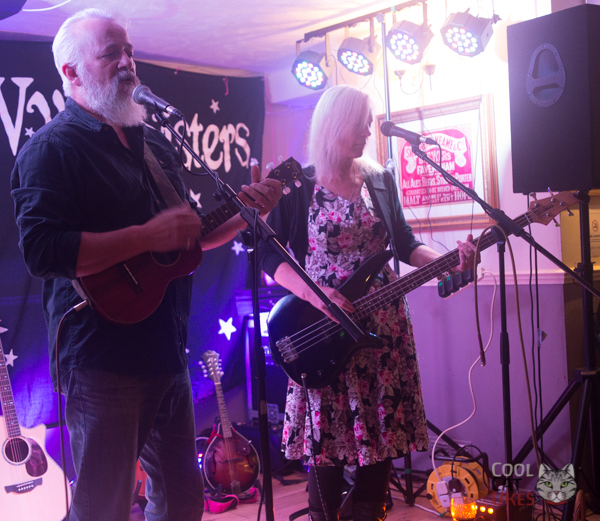 So, before I start, a disclosure - I know The Hedge Inspectors pretty well, I've seen them many times and actually play alongside them every Tuesday at unplugthewood. So, maybe I'll be a little biased, after all, these are the people who have been my biggest influencers and encouragement in the ukulele world. But, I will try to be objective in what I write and get across the feeling from this gig. 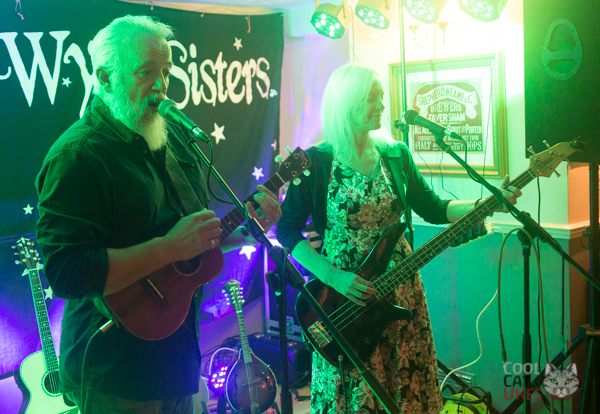 But, along with his wife, Caroline, they have their own material which they have been plying around many of the UK festivals and lately, have been absorbing Mike's back catalogue into their set. 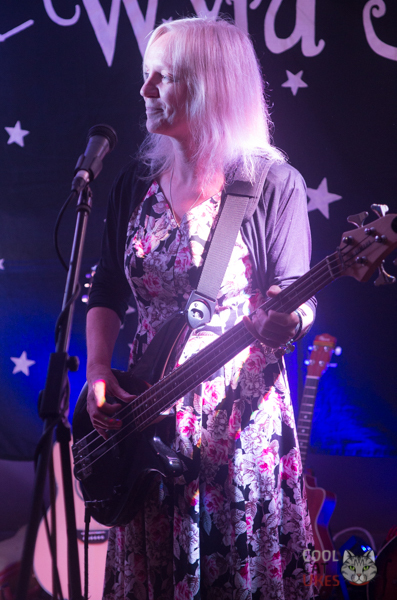 This gig actually saw them supporting a local band - 'The Wyrd Sisters', and along with another exceptional performer, a guitarist called Robyn Wallis Johnson made a brilliant contrast to the hyper active Ceilidh influenced music that the headliners perform. It was held at The Lamb in Farnham, actually where on the fourth Thursday of every month is another unplugthewood session - normally a bit quieter and refined than the regular Tuesday nights. Worth a visit. The Hedge Inspectors had a fifty minute slot and they filled it well with a wide variety of tunes. They opened with the light-hearted 'Catch Of The Day' and followed up with 'Stuff Aint Good'. Mike writes all the material, and during the evening I heard many interpretations of the lyrics. Are they made up, about Mike's thoughts? I hate to interpret songs, but I feel an affinity with this one, often being misunderstood myself. Compared to the Krabbers original, the style they performed added a bit of a reggae riff, and Caroline adds beautiful harmonies as she does on so many songs. At this point, a very noisy drunk in the bar started having a sneezing fit, and Mike cleverly added a 'bless you' into the song. Mike was also practising his stand-up routine. Many of his songs originate from poems he has written. Again, some silly, some poignant. Every two or three songs, Mike would ask the audience to call out a subject and then recite a poem from his little black book (oh how I'd love to browse that book - or maybe publish it?). Short poems, but a nice break between songs. Then 'Bump Uglies', a song about an affair with a milkman. I always love a song that's grounded by dropping in the name of a well-known supermarket. This is where you begin to realise the versatile genius in the song writing. They tell you that good comedy is about timing and surprise, but adding that into songs that are musical - not just chord and verse - takes that genius to another level. Anyone who has written songs will appreciate how good this is. A favourite song for every one is 'Stars Will Guide Our Way', and we haven't mentioned Caroline much so far, but adding the bass to this song in the live performance really lifts it. Clever arrangments in 'I've Got You To Thank' have a bass line on the baritone uke contrasting with Caroline's bass guitar. Then the haunting and complex 'Leave a Light On' sees Caroline silence the bass and simply add vocals. Sometimes, less is more, and so often musicians don't know how to restrain themselves - nicely done here. 'Dead Rat' lifts the mood. There was a shout of "sad song!" from the back of the room, but I just enjoy it as a simple life observation. It's a silly song, just observational comedy, isn't it? 'Angry Bees' - That old Krabbers classic. More audience participation, but can they get the timing right? Everyone laughing by the end of the song. 'Free Man', then 'Pre-owned' this is a Hedge Inspectors classic, I reckon. But now with added bass ups and downs. I've just started learning bass and found it really intriguing. I've seen Mike & Caroline perform this one many, many times, and they do just get better. Towards the end of the set, they lift the tone with the drum and bass style of 'The Hitcher', then the meaningful 'Peace Of Rock' and finish with the only cover of the evening - 'Jump Around' to finish. Mike lets loose with his pedal board, so far used very subtly to control the sound, but now with loads of echo and effects. Not just a cover, but a unique interpretation. As an aside, Spike Milligan used to be my favourite poet, now I'm not so sure. Hopefully, The Hedge Inspectors will have an album soon, but until then, catch up with them on their YouTube channel, and via the unplugthewood website. Maybe we can persuade Mike to publish his poems, too? A fifty minute set with a mix of comedy, stories and good music - fourteen songs. See them when you get a chance - or book them for your event. Great musicians & nice people to boot. I've met The Hedge Inspectors too. They came along especially to visit us at Cool Cat Ukes HQ.